Humanity was created by the luciferian serpent group of demonic entities. Our created body of light energy includes 2 main fields. One is electrical and the other magnetic. We have seen within the first few pages how the positive male protons – the negative female electrons – and the neutrons – gave inspiration for the manufacturing of a number system. This in turn led to the creation of a religious system and in turn to the establishment of a scientific system. Both systems were based on the manipulation of the structural characteristics of a beam of light. The number system was constructed to be just slightly off the natural course of this luciferian creation. 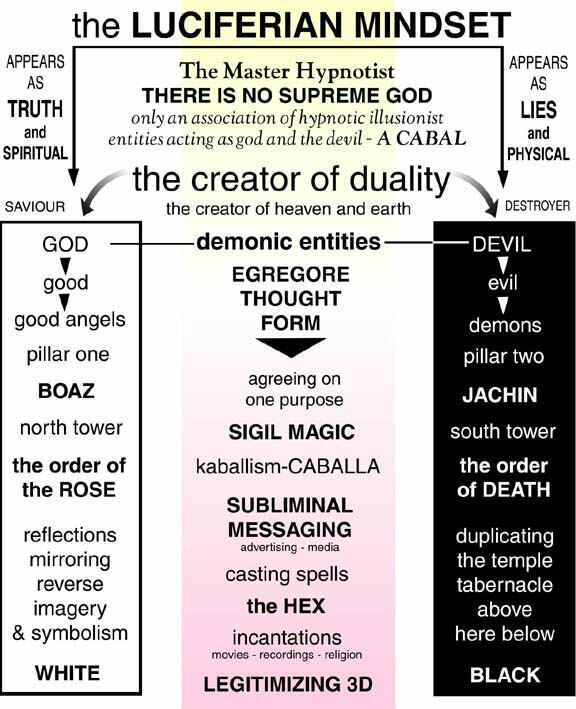 Although both were created by the luciferian thought form, they were purposely created to conflict, one with the other. This is the true nature of duality in this 3 dimensional realm. There are a couple of characteristics regarding the human magnetic field that are worth examining. An iron object can be magnetized by STROKING or by STRIKING with FORCE. This process takes place because of the structure of the light energy magnetic field. Humanity has this very same magnetic field. We have within our blood, a concentration of iron that can be manipulated to effect our DNA. When the very same techniques are applied to a segment of society as are applied to a piece of iron, the very same magnetization occurs. Interestingly, iron in Latin means stars (STARS = HEAVENLY BODY). Nickel can also be magnetized and in German it is referred to as Old Nick’s Copper – or Satan. This sort of gives a hint as to where Old St. Nick or Santa – SATAN – Claus comes from as well. The Canadian and American 5 cent coins are made of Nickel (5 SENSE REALITY = 5 CENT COIN). Cobalt can also be magnetized and cobalt in German means GOBLIN or EVIL SPIRIT. Both Cobalt and Nickel are found in meteorites, or material from the STARS. This shows just a few interesting characteristics of the metals that can be magnetized and how spiritual implications are suggested in each name attributed to the metal. The diagram below shows what happens to our magnetic field when influenced by the luciferian Thought Process. In diagram A, we see the random magnets (the little red arrows) within our magnetic field forming little domains. These domains point in every direction and thereby render no magnetic polarity. One domain basically neutralizes another. In diagram B we see this random magnetic characteristic become highly organized and all the magnetic domains point in the same direction. This new organization of the magnetic domains is caused by a strong external magnetism. When given a 3 dimensional world perspective, this strong external magnetism is the luciferian inspired, illuminati world system of deceit. The illuminati deception, is of course, the product of the luciferian egregore Thought Process, where a massive group of hidden entities agree together – just like the domains pointing in the same direction – and this common Mindset creates an incredible magnetic attraction that is able to manipulate humanity. After the magnetic pull of the luciferian thought form seduces humanity to go in a certain direction, all of the world societies are likewise magnetized, by force or by this seductive magnetic attraction, to point in the same direction. All of the seductions of the world created through the number systems have attracted us to respond in the direction they desire. Looking at diagram C, even when the strong external influence is removed, the magnetic field remains basically intact and polarized. Again, this is exactly what happens when the luciferian Mindset is brought into any society. It enters society as an advancement or betterment of the current state of affairs. Once established and the society becomes polarized with this new point of view, the external force can move on to other conquests but we will remain performing the will of the master magnetic influence. This master magnetic force is the hypnotic trance of the master hypnotist, the luciferian group of Thinking entities. In this 3 dimensional realm, we will continue doing the work of the serpent thinkers, which is to become totally devoted to acquiring as much physical wealth and pleasure, which is not wrong in itself. However, in the hypnotic state we find ourselves in, we believe this is the ultimate purpose and goal concerning the 3 dimensional life experience. Because of this fervent desire for riches and pleasure, if any of that is jeopardized in any way, we scream bloody murder for the people in power to fix it. Of course, they will fix everything in such a fashion, that will only create more problems, which will make us more and more dependent upon their involvement in our illusory lives. This in turn causes an even stronger magnetic need and attraction to their control. The leaders of the world, the rich, the powerful, the respected…these are the intellectually indoctrinated, luciferian minded illusory slaves, working on behalf of the luciferian agenda. When the sacred geometry of the luciferian mindset was introduced into this 3 dimensioanl egregore thought form, a total disregard for the natural luciferian state of creation was purposely devised. This included taking natural pi and the endless decimal number of 3.141…(plus endless numbers) and rounded it down to a perfect pi – or 3. The same with the Golden Ration, or Golden Mean and the natural phi of 1.681…(plus endless numbers) and rounded it down to 1.6 or perfect phi. This all coincides with the 360 degree or 360 day year of the zodiac circle which was rounded down from a 365 1/4 day (plus a minute or two) year. This allowed for sacred geometry, mathematics, algebra, chemistry, astrology, numerology, music and an endless vast array of seductions to be devised which would flood the world. You cannot create a solid formula, calculation or equation unless you round the numbers down. How can you take real pi – 3.141…with endless numbers, and multiply it by anything, and come to any conclusion. You can’t! You have to manipulate, or force the calculation, to get a result. This forcing, led to the creation of the number systems which drive the world and seduce us into the hypnotic state we’re in. REAL PI – 3.141… or natural pi became PERFECT PI – 3. The Golden Ratio or NATURAL PHI became PERFECT PHI or 1.6. With this manipulation and creation of a number system, TIME and SPACE appear to exist. Only as you perceive time do you perceive space. All this deceit is the result of a numbering system. This so-called, 5 sense world reality, based on these sacred geometric and religious systems are unwittingly worshipped by every human being on the planet as being the truth of what life is all about. In reality, all these systems are corruption and have no connection to awareness. Life itself, is also a complete fabrication, and an immense illusion. Lies based on previous lies, multiplied by yet more lies, does not foster truth. It creates a Universal Lie, which is exactly what the whole universe is. See the diagram below regarding another characteristic of our magnetic personality. This observation shows the deceit used by the luciferian Mindset to keep us blind to these simple truths. This deception that causes humanity to accept this number system as reality is how we have all been manipulated to accept the number of the beast. This beastly number is referred to in the Christian Bible, and is placed there, by the very luciferian egregore beast that wrote the Bible. All numbers make up the whole number system, which in turn is the number by which humanity is not able to buy or sell. You cannot buy or sell, carry on commerce, or even retain a physical presence in this 3 dimensional space, unless you accept this number system as part of your reality. This of course, is the hypnotic trance state that we accept. Accepting this number system, this 666, (or as will be shown in later pages to be SICKS SICKS SICKS), is how the 3 dimensional realm persists. It persists because we insist, in our belief system, that it must exist, therefore it does, and all manner of manipulation is then possible. Manipulation by this luciferian light bringer / the shaitan, the prince of darkness, occurs in a couple of ways. One is by seducing the masses through the peer pressure to succeed in life. To have a nice home, a nice car, a nice family, nice clothes, money in the bank, to belong to institutions, to be the leaders of these institutions … to literally be a pillar in society. This is the STROKE method of manipulation and magnetization. Gentle and sweet but still as destructive as any method devised to steer the luciferian conjured up soul of humanity into ignorance and the luciferian Mindset. The second method is the FORCED method of manipulation. This one is not so sweet. It includes genocide such as has been evidenced in Nazi Germany during World War 2 and the extermination of the Jews. Although the extermination of the Jews is massively overstated, it did occur. Just looking at the numbers quoted, 6 million, is simply a reference to the Christ/Antichrist number of the luciferian prince. A prince, which does not exist, other than in the suggestion that there is a Messianic Christ, and an enemy of that Christ, or an Antichrist. Neither of which are real other than in the suggestion that they do exist. Without this unending suggestion, the very notion of the validity of such a concept would fade away, and would not be part of the 3D trance state. This is precisely the same suggestive process that’s conjured all of humanity into appearing to be a real and valid entity, but has no basis in reality. After World War 2, 1200 Nazis were smuggled into Canada to exterminate the rest of the Native Indian population with the cooperation of the government, the RCMP, the churches and the medical institutions. A minimum of 50,000 Native children were exterminated. (See http://hiddenfromhistorykevinannett.blogspot.de/).The total number, when you include the centuries that this went on before the Nazi mind control invasion, is in the millions. When you stroke the ego of a society, the ego that appears to be part of who we are, you create a willing blindness. It is mind control with a pretty face. It magnetizes the population to do the will of those desiring to run society. When you strike at society with the force and horror of genocide and war, you create fear in the victims as well as in the population forced to carry out the atrocities. Everybody, victim and victimizer, lose. Everyone is forced into a magnetic polarity where hatred, killing and death are the only winners. This is the Thought Process, and its weapon of Duality, used to initiate, and perpetuate endlessly, the Trance State. Having said this regarding the magnetic characteristics of humanity, what do we do about it? The answer is NOTHING. Other than to expose the utter ignorance of such a regime and system, … we are to do nothing. In the last century people pointed to Ghandi as one who peacefully resisted the British. He still resisted. We must not resist, react, retaliate, resent, seek revenge … for all of this is emotional reaction to an illusion. Ghandi was reacting to an illusion. Resistance is the energy/spirit illusory force that the luciferian illuminati elite are looking for and need to continue the luciferian agenda. Of course, it must be recognized, that these elite have not the slightest notion of what it is they do, for what reason, and neither do they perceive the master hypnotist they serve. The elite of the world are indoctrinated in intellectual concepts, all of which have produced deeply entranced, totally unaware, slaves. In the 1960’s people looked to Martin Luther King as a passive protestor campaigning for the rights of blacks in America. That protest is the energy/spirit which feeds right into the hands of the luciferian Mindset. These and many others have focused our attention on the plight of the poor and weak and helpless. This misdirection from Reality has manipulated who and what we really are, into a prison of CARE. All this is true and horrific, from a 3 dimensional perspective. However, this is the manipulation of religion, intellectualism, and is the foundation of all Secret Societies throughout this illusory history, to manipulate who and what we are, out of our original wisdom and reality state, into a sphere of CARE and CONCERN. All of which solves nothing, proves nothing, exposes nothing, but does perpetuate the myth and the lie. In this state of CARE and CONCERN we react, we seek revenge, we retaliate, we resist, we rebel … we totally respond the way the luciferian Mindset want us to respond. (Notice all these RE- words again – that’s no coincidence as I will show in a subsequent page on the ALPHABET). Look at the word REBEL. This word means RE or reference to – BEL who is Bel or Baal. In other words, to rebel is to act in the manner of Baal. Baal was the Phoenician god responsible for the fertility of the earth and animals. Just another name for a sun god deity. RE = RA, the RAY of LIGHT, another name for the Egyptian sun god deity. We mustn’t be manipulated to extend a reaction concerning energy/spirit which they need to perpetuate the myth and deception which holds us within the Trance State. Their system is in its last breath and on its last legs. It is self-destructing right now. They are collapsing in on themselves. In the next few years they are going to try to pull off the most massive form of deception ever attempted on humanity, using the illusory body of humanity, which is their secret weapon of manipulation, to create a deep disconnection from our original Reality State. These hidden luciferian entities and their world elite are going to attempt to put the crowning touch, the coronation, so to speak, on the New World Order, the so-called Kingdom of God, or the Age of Aquarius, which is already controlling us. Causing us to believe, through incredible devastation and horror, that these coming events are the Day of the Lord’s Vengeance, when the messiah will establish the kingdom of god on earth by destroying the “useless eaters”, (as folks like Henry Kissinger have referred to the common people of the world). All this with regard to controlling the power of the eternal Paradise State, which is who and what we really are. We need the information available on this site so we can know, as the campaign of deceit increases, and begins to show its true face, that this is the agenda, the plan for 6,000 illusory years, (for TIME and SPACE do not exist), that will be attempted to be fulfilled in the next handful of years. As things keep unfolding, if we know that this is what’s happening and why it’s happening, we can remain calm. We can expose the agenda with total awareness of what’s transpiring, but we MUST NOT REACT or seek revenge or believe for one second that this is the supreme god and his prince of peace. There is no god, just a luciferian group of entities playing god and the devil, and creating duality in this 3 dimensional realm at the expense of humanity, using the suffering of humanity, … and in the same instance, humanity is just a conjured up illusory body of energy Thought Forms, used to make us believe that we’re real, and that we should CARE and be CONCERNED, when in Reality, … ALL IS WELL, and were it not for the hyper reactionary intellectually indoctrinated and religious slaves, feeding nonsense into the 3 dimensional plane, the whole thing would completely fall apart, and a reconnection to Reality would pursue. It must be pointed out, the the intellectual and religious reactionaries that assist this luciferian agenda for control of our eternal Paradise State, includes the Truth Movement and the Conspiracy Theorist Movement. All of which are designed by the luciferian Mindset to manifest a untold amount resistance, revenge and retaliation. How can one be so certain that their system is finished and that the whole thing is collapsing. First off it’s just obvious. We’re killing ourselves with disease, pollution and war. Secondly, when you saturate a magnet with a particular magnetic polarity you wish it to take, the thing that happens, if you over-saturate it, it loses all its magnetic strength. Similar in fashion to sharpening a piece of metal. If you over-heat the metal it loses its temper and is unable to hold an edge. Therefore, this system is collapsing. The attempt to over-align the magnetic domains has taken place. This is evidenced in the disbelief of the majority of the world population that anything good can come out of the system anymore. We have been oversaturated and overheated. We have been created by this luciferian mindset as flesh and blood – simple clay – and we have been over-stretched, forced to far, by the iron hand of the SATURATOR (Saturn = Satan) to not want to cleave to the system anymore. Will they let us go, peacefully,… kindly,… or will they make a Day of Judgment, designed to manipulate all who resist, to experience a Day of Reckoning, and Destruction, through a world cataclysmic event? Keep reading this site … all the answers are just ahead. Return to the top of the page and click on Page 10.